Typically, military or industrial application-specific fiber optic systems are complex, conforming to stringent dimensional and optical standards. 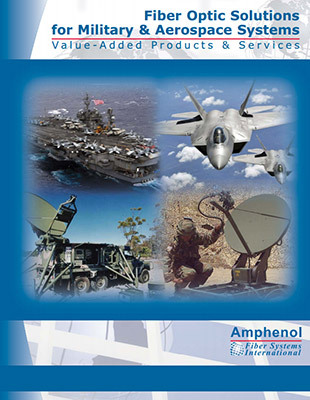 For new or existing projects, Amphenol Fiber Systems International (AFSI) provides engineering assistance and value-added services for the most challenging fiber optic interconnect and system requirements. Whether the application calls for a high-precision fiber optic interconnect or a junction box design, AFSI’s engineers and technicians are capable of developing the fiber optic system solution to meet your particular needs. When it comes to the manufacturing of the system, AFSI can build it to a customer print or design a system from a set of requirements. Our knowledgeable team of trained fiber optic professionals is adept at specifying, qualifying, testing and assembling a wide variety of components such as splitters, optical switches, transceivers and wavelength division multiplexers. AFSI personnel are also proficient at fusion splicing, stripping exotic jacket materials, precision tolerances and fiber winding. All manufacturing is performed in our AS9100, ISO 9001:2008 and MIL-STD-790 certified facility, ensuring the highest levels of workmanship and performance available. Customers should fill out the form on this page or call their sales and customer support contact at 214-547-2400 or 800-472-4225.